Several people turned out for a hearing on changes in the collective bargaining law. There was an emotional hearing this morning as dozens of union members packed into a capitol committee room to speak out against changes in Iowa’s collective bargaining law for unions that represent government workers. Teamster Jason Back works as a paramedic in Madison County and he choked up as he pleaded with legislators to table the proposal. “My wife tells me when we get into an argument: Hear me. Don’t listen to me. Hear me,'” Back said and as he started to cry, the crowd applauded. 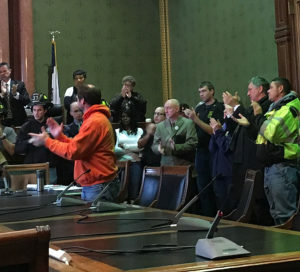 Union members clapping during the hearing. Critics say the bill will only let government employees in Iowa, including teachers, bargain for their base wages and nothing else. Two of the 20 people who spoke at the hearing favored the bill. Iowans for Tax Relief president Chris Ingstad said the bill’s needed because the size of state government is growing faster than the personal income of Iowans. “Reform is needed because Iowa should have in place a system that is able to find cost savings without having to cut jobs or cut services,” Ingstad said. Representative Bruce Hunter, a Democrat from Des Moines, then clashed with Ingstad over whether government workers in Iowa make more than employees in the private sector. Connie Hanson has worked at the state prison in Fort Dodge for 19 years. She’s a member of the AFSCME union and she said the bill will “gut” Iowa’s 43-year-old collective bargaining law. “It kind of makes me sad that you guys would sit there and lie, even on the radio and say: ‘No, we’re not planning on gutting this,'” Hanson said. Charlie Wishman, the secretary/treasurer of the Iowa Federation of Labor, accused Republicans of trying to “destroy” the public sector unions that are covered by a section of state law called Chapter 20. Ross Grooters of Pleasant Hill, a member of the Brotherhood of Locomotive Engineers and Trainmen, said Republicans are shutting out the voices of union workers. “You’re letting us speak, but you’re not hearing it and it’s shameful,” Grooters said. A few minutes later, after the hearing concluded, there was more cheering from union members and one man in the crowd yelled an obscenity at lawmakers. At this hour, the bill has cleared a House subcommittee. It will be considered in the House Labor Committee late this afternoon. An identical bill is making its way through the Senate as well. A Senate subcommittee is holding a midday hearing on the measure.